"Very easy and quick to make!" The lemon in this gives the dish a bright flavor and balances the sugar well. 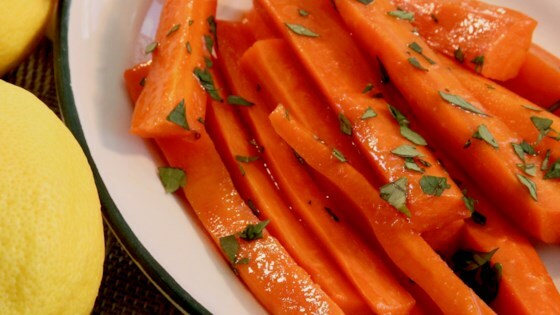 You could pre-cook your carrots and then re-warm and glaze just before serving. Thanks! I loved it. I put my carrots in top of my rice cooker and cooked them separate. I left of the salt and very little pepper. I never salt anything. If you want it you can put it in yourself. No changes but next time will wait just before serving and then add glaze. I used honey because I did not have any brown sugar and I also added a little ginger.